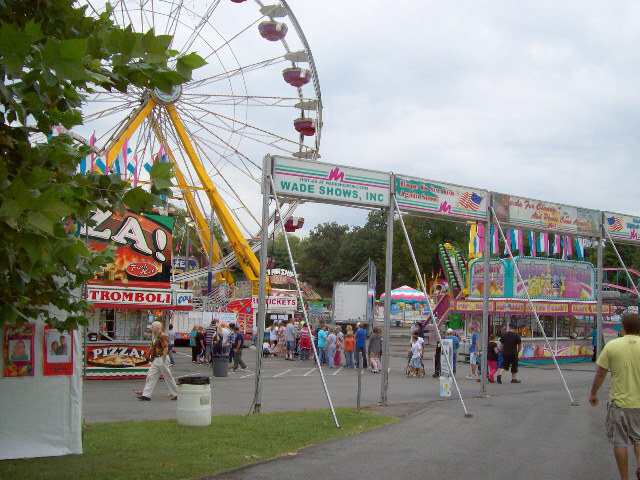 On the opening day of the Tennessee Valley Fair attendees could get admission for only $1.00. To commemorate the 91 years of existence this discount was only available for the first 91 minutes that the fair was open. We arrived just before 3:00 p.m. on Friday, September 10, 2010. We were surprised to find plenty of available parking. The cost was only $5.00 at the fair entrance by the Knoxville Zoo. The line stretched across the fence in front of the fairgrounds and was much shorter than we had expected. Hubby and I waited for a few minutes with the other people who were in line. Anticipation was infectious. Everyone was in the mood for a friendly good time. Once inside the Tennessee Valley Fair we were not disappointed. This is always a fun family centered event. As we walked by the animal exhibition area we couldn't help but be impressed by the care and attention given to the animals. Equally impressive were the items on display in the Kerr Building. Competitions included Fine Arts, Photography and home centered activities. Hubby couldn't wait to get to the photography area. While his photos didn't win they were chosen to be displayed. When you visit the Tennessee Valley Fair be prepared for the photography exhibit to knock your socks off. Inside the Jacob Building we were inspired by the charity displays. Cost Cutters were giving haircuts to benefit Children's Hospital and The Therapeutic Riding Academy of Knoxville had a booth. There were also businesses and other vendors as well as kids exhibits on display upstairs. The Jacob Building stage provided entertainment. The classic tractor exhibit, rides, games of chance and more waited on us as we continued our tour. See the ferris wheel and exhibits on this YouTube video.